Northumberland County is situated on the north shore of Lake Ontario, in central Ontario. It is located east of the Regional Municipality of Durham, west of Hastings County, southeast of Kawartha Lakes, and south of Peterborough County. The population of Northumberland (combining the County and Alderville First Nation) is 85,598. Northumberland is part of the Kawartha Pine Ridge District School Board and Peterborough Victoria Northumberland and Clarington Catholic (PVNCC) District School Board. The Northumberland area also has one OPP Detachment and two police services. Northumberland is serviced by Northumberland Hills Hospital in Cobourg and Campbellford Memorial Hospital in Campbellford. 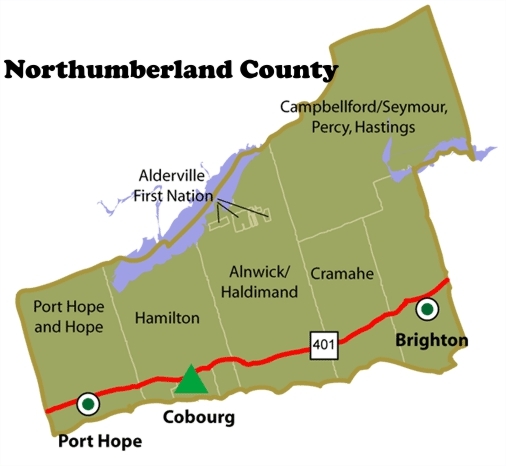 Northumberland County consists of seven municipalities with Alderville First Nation within the Northumberland census division but is independent of county administration.